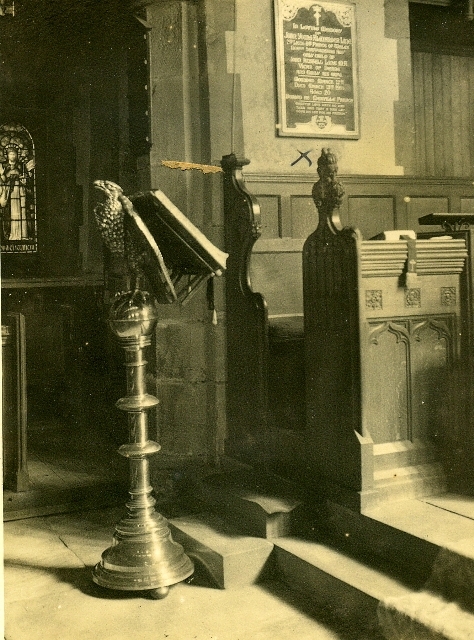 The brass lectern in the form of an eagle was presented to the church in 1877 by W.Hulton, Esq. One of the previous lectern Bibles was vandalised during a break-in with the intention of setting fire to the building, and was replaced with a new Bible dedicated to the memory of Harold Sutcliffe (between 1986 and 1993). Since then, the bible has been replaced at least twice to reflect the move away from 'Thee' and 'Thou'. The current one is the more trendy NIV version. This photograph is interesting in that it shows where the Heaton family had their chapel. Before the reordering of the church in the 1980s the Guides used this area at the Parade services.